Question: So does this come like in the pic or is each case a single color? Answer: (AP Reply) The pic is a reference image for colors in order. The set changes per inventory availability. Question: Would it be possible to get to pick 2 colors I need or is it all random? Answer: (AP Reply) This is subject what we have in inventory. We suggest purchasing specific colors separately with this pack. 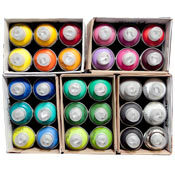 Question: Do you know if this brand is good for like Spray Paint art on regular semi gloss or glossy surfaces/posters ? Answer: (AP Reply) You should always consider buffing slick or glossy surfaces a bit to give tooth for paint to adhere to. Question: do we pay through credit card? Answer: (AP Reply) Sure do. Please go ahead and proceed with check-out on the site. Happy Painting. Question: Does white and black come in this pack? Answer: (AP Reply) It should. But its determined by inventory so its not guaranteed. That said, I dont remember ever running out of this color so I think we will be good.